I guess my husband’s going to need that pillow after all. 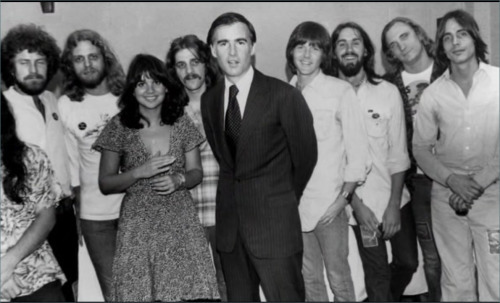 From left: Don Henley, Don Felder, Linda Ronstadt, Glenn Frey, Governor Jerry Brown, Randy Meisner, Dan Fogelberg, Joe Walsh, and Jackson Browne circa 1977. When I read Friday’s news that the California legislature had passed the right to die legislation, I thought maybe my husband was going to be able to throw the pillow away. We have a deal, you see, if Alzheimer’s comes to strip me of my brain, and with it the lifetime of memories I’m penning feverishly here in this space, he’s going to off me with a pillow. A nice big fat puffy down pillow. It’s only half in jest; my mother died after living with Alzheimer’s for over a dozen years, each one more and more debilitating, each one leading her down a rabbit hole I have no desire to dive down into. It’s dark in there, and dank. I’d rather die while it’s still light. While I can still look at my son and know his face, say his name. While I can still remember who I am and who I used to be. My husband insists there won’t be any need, that the miracle of science and technology is making such huge strides that even if I do develop Alzheimer’s, I’ll be able to get it whisked away by laser or pill or something we can’t even imagine yet, and I’ll be fine, fine, fine. If not, there’s the pillow we half-joke about. Or we could move, like Brittany Maynard did when when she was diagnosed with terminal brain cancer, up to Oregon, where assisted suicide is legal. Except they’ve never wanted Californians in Oregon. The rumored signs near the California/Oregon border in the 1970’s may be apocryphal but the attitude isn’t. Welcome to Oregon. Now Go Home. If they didn’t want us when we were healthy and thriving, they sure don’t want us when we’re at the tail end, the frail end, of life. The End of Life Option Act just needs the guv’s signature to become legal which may be a little dicey since Jerry Brown, before we Californians knew him as Governor Moonbeam rocking Linda Rondstadt as his girlfriend in the 70’s, is a former Jesuit seminarian. The stricture of his faith, just one of the factors opponents of the bill cite, will make this an uneasy decision. The good news for the Death with Dignity movement is that if Brown neither signs or vetoes the bill, but does nothing at all—how hard is that for a politician?—the bill will pass. But that good news only applies to people truly in the last stages of life, with less than six months to live, when their suffering is unbearable. Patients have to be mentally capable of making medical decisions which counts people with Alzheimer’s and dementia out. For right now, it doesn’t sound like advance directives would be allowed. My heart goes out to Brittany Maynard who was forced to go to Oregon to escape her pain and end her days miles away from her own home, friends and family. I can’t believe in a God who’d want that. As for me, my husband’s probably right, I won’t have to wear that particular scarlet letter on my chest. I’ll be fine, fine, fine. If not, there’s always the pillow. Update: Governor Brown signed the bill on October 5th. He should be applauded for his compassion and his courage.